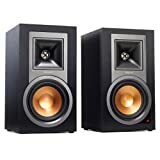 Continuing on the mark of offering convenient and space-friendly monitors for sound systems and studios, Klipsch delivers again with uncompromising quality with their offering of the R-15PM Bluetooth Monitor Speakers. Touted as being the best performing Monitor on the market, you'll find a boatload of options for connectivity to these powered monitors. 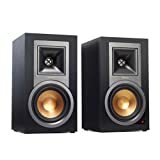 Overall an incredible set at an affordable price for the consumer who is looking for a high quality pair of monitor speakers! The Klipsch R-15PM Powered Monitor Speakers with Bluetooth produces clean and dynamic sound without taking up too much space. Often described as minimalist but powerful, the speakers have flawless amplification that ensures high quality output. It also comes with various connectivity options ready for television, turntable, computer or phone. Here’s all you need to know about Klipsch R-15PM speakers. The R-15PM Speakers feature a minimalist design with black polymer veneer finish, while screaming efficiency and versatility. The speakers come in a pair when purchased. Each is 12.5 inches high and seven inches wide with a depth of 8.11 inches and a weight of 10.3 pounds. Each speaker includes 1” Aluminum diaphragm compression driver with a square Tractrix Horn for stable high frequency. For its rich low frequency, each has a 5.25” copper spun magnetically shielded IMG woofer. Klipsch R-15PM Speakers look simple at first glance, but it boasts flawless Bluetooth wireless technology, integrated phono pre-amp with ground screw terminal, digital optical, analog RCA and USB inputs. These versatile speakers are ready for anything even without a receiver – TV, PC, phone or turntable. It can also be connected to a subwoofer for a richer and deeper sound range. The R-15PM is considered one of the best powered monitors on the market because of the versatility of input/output options. The speakers don’t take up too much space, but it fills the whole room with clear and dynamic sound. The built-in ultra-low noise amplifiers ensure maximized output and high-quality performance. There would be no need for any external amplification in the future. The speakers also come with an IR remote that can play or pause, track controls and select source. Reviewers are impressed with the excellent Bluetooth technology and the other connection options that come with the speaker, making them surprisingly convenient. One user who set the speakers with a computer system finds the sound to be very clean and untiring. Some also liked the easy and hassle-free set up. Almost all reviewers have little to no complaints. Most reviews are all about the impressive sound quality of the speakers and the convenience it offers. The only downside is that it does not have a subwoofer, which could have enhanced the low frequencies. Reviewers claim that the sound is impressive even without a subwoofer, but would recommend using it with one. 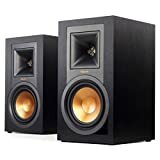 If you need a quality sound system that doesn’t take up too much space, the Klipsch R-15PM Powered Monitor Speakers are the right choice. Save yourself the hassle of needing a receiver or dealing with connection problems. 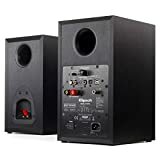 The R-15PM speakers are simple and easy to set up, use and connect without compromising power and performance. It’s perfect for any kind of entertainment – listening to that new album, watching the latest movie sequel, playing a video game or catching the latest episode of that popular TV show. 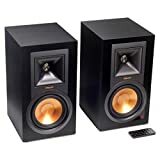 Get your Klipsch R-15PM Powered Monitor Speakers with Bluetooth (Pair) here.